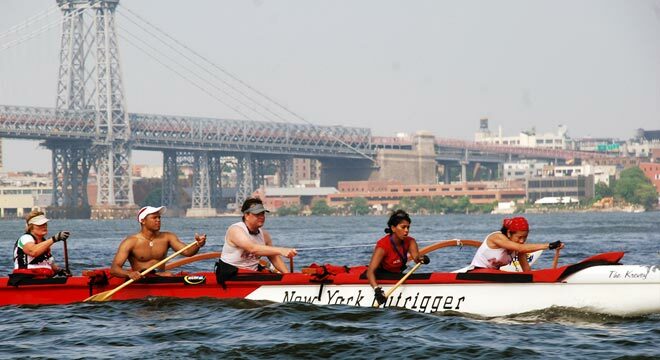 New York Outrigger (“NYO”) is a New York State not-for-profit and IRS recognized 501(C)(3) organization dedicated to educating New Yorkers about outrigger canoe paddling and providing access to our local waterways. Established in 1996, NYO has provided thousands of New Yorkers with the opportunity to experience their city from its waterways. Our 100% volunteer-run organization is comprised of a diverse group of paddlers from various professions and backgrounds. Located at Hudson River Park’s Pier 66, NYO provides free outreach programs and low-cost team training. In 2014 NYO started our Makapo-NYO program to serve blind and visually impaired New Yorkers. The program is run in partnership with the Makapo Aquatics Project and Access Quest, and integrates blind paddlers into NYO activities, allowing them full access to NYO programming, including racing. For more information on New York Outrigger and the various programs we offer, please visit newyorkoutrigger.org.